Some dilemmas, such as choosing a Porsche, Mercedes or BMW, are nice to have. The farming equivalent might be wheat, canola and oats, as they all boast strong science, promising yields and a stellar reputation. And like high-end vehicles, these three crops can get you where you’re going in style. “Oats are lagging a bit behind crops like wheat and canola in some respects, but we are a small community that works well together on a global scale,” says Dr. Jennifer Mitchell Fetch, a research scientist and oat breeder with Agriculture & Agri-Food Canada (AAFC) based in Brandon, Man. The oat community has made great strides over the last decade in sequencing the oat genome, with some findings to be published in the near future. “We’ve done a lot of collaborative projects to develop molecular markers that can be used in breeding programs,” she says. One of those programs is currently running at the Brandon Research and Development Centre. 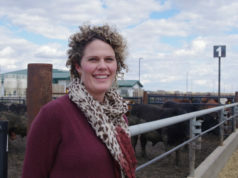 Dr. Mitchell Fetch and her colleagues are developing milling, feed and forage quality oats with improved nutritional quality and reduced business risk for production in a sustainable cropping system in Western Canada. Through research and breeding, they have raised beta-glucan to the 4.5 per cent level required by the milling industry while lowering the fat content of oats. They’ve also had success with disease resistance and are working to find more resistant genes to stay ahead of ever-evolving pathogens. “The primary area of wheat research today is disease resistance,” says Dr. Richard Cuthbert, a research scientist and wheat breeder with AAFC in Swift Current, Sask. Another priority is agronomic performance in areas like nutrient use and water-use efficiency. Ultimately, it’s about maximizing yields and stabilizing those yields over the extreme environments found in Canada. “New genetics are pushing the envelope for what is possible with yield and allowing wheat to do well in different ecological zones across the Prairies,” says Cuthbert. As a crop for farmers, wheat has a lot to offer. One reason for the range of marketing options is wheat’s reputation. In 2009, three major seed companies in Canada opened or announced new canola research and development centres. The following year, industry and the federal government launched an ambitious program directing more than $20 million of funding to canola research projects. Clearly, this is a commodity committed to progress. But it didn’t end there. In 2015, the industry’s new Innovation Strategy for canola identified gaps and opportunities in all aspects of canola research. The strategy encouraged a good balance of applied and pure research driven by private/public-funding partnerships and collaboration between industry and academia. While research is critical, Toma says the appeal of canola for farmers is simple: it makes them money. As with any product, demand is the bottom line. It’s not just canola that’s in demand, however, but Canadian canola in particular. That may explain why in 2016, despite disease and moisture challenges, Canadian farmers achieved record canola yields. Oats, wheat and canola are unique in many ways, yet share a number of attributes appealing to growers. Whether you’re seeking a high-end car or a high-yield crop, quality, performance and reputation are critical. In either case, if you protect it, treat it well and choose the one that suits you best, you’ll be on the road to success in no time.